I have been a fan of Lori Foster for years and I love anything she throws at me. The light-hearted sweet stories are not to be overlooked in favor of her other genres. 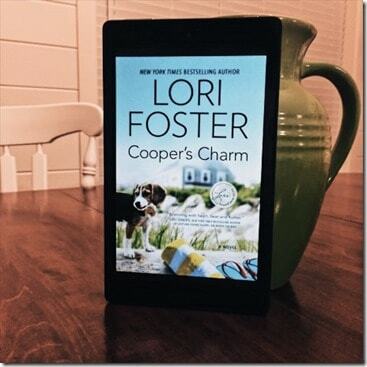 With Cooper’s Charm, I got my mystery along with unforgettable characters. Phoenix Rose is trying to join the land of the living again after a horrific robbery left her in the hospital. It has taken her six months to recovery physically and emotionally and she decides to start over at Cooper’s Charm. This lakeside resort/RV park is owned by Cooper, who has his own share of devastating loss. Phoenix takes the landscaper job and spends her days taking great pride in the hard work required to keep Cooper’s Charm…charming. Her sister, Ridley decides to visit Phoenix to make sure she’s really recovering and decides to stay. The scuba instructor, Baxter, may have something to do with that decision. Overall, I thoroughly enjoyed this book. I loved getting to know both of these sisters and the slow burn build of trust and romance with Cooper and not-so-slow build with Baxter. The mystery and action helped keep this book moving quickly and I’m always waiting for the HEA. Thank you to NetGalley for the book for my honest review.